Electric patio awnings add further luxury with convenience, effortlessly opening any size of canopy, helping you to enjoy your patio even more. Whatever your space, whether large or small, our electric patio awnings offer maximum pleasure with minimum effort, taking the chore from operation; leaving you to unwind enjoying your patio rather than unwinding gearbox cranking handles. We all look forward to summer days, spending time relaxing while enjoying the garden. With electric patio awnings from Elegant your patio swiftly becomes a more defined and accommodating, protected space; instantly roofed at the press of a button, free from summer heat or uncomfortable glare. With such swift, easy electric operation, you'll find yourself enjoying your patio more, more often, even for those short coffees when manually you might not have bothered. 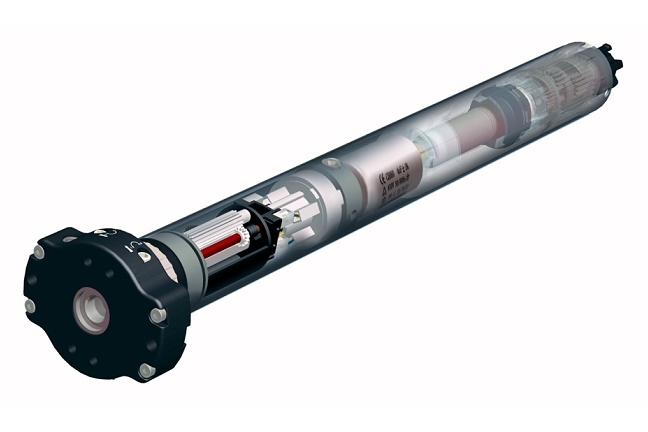 An electric tubular motor is installed inside the awning fabric tube, neatly hidden away, not requiring any additional space or adding any size to your awning. 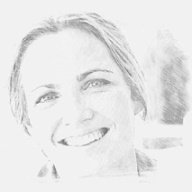 Electric operation is reasonably quiet, it takes just thirty or forty seconds to extend most patio awnings - and the awning can be stopped part way if desired. 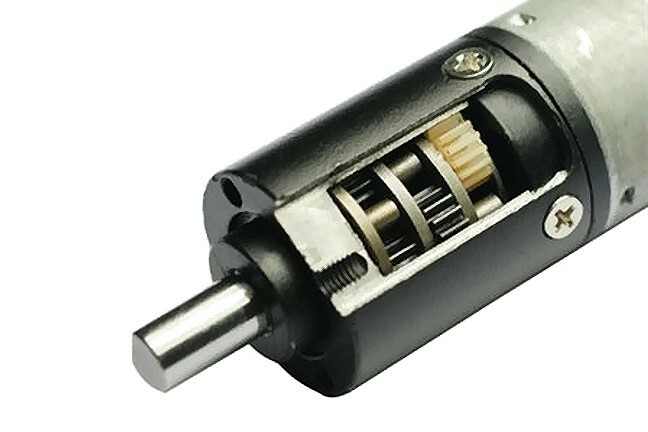 Electric drives are built to different sizes, an appropriate size and torque required for larger or smaller patio awnings. Taking just a 3 amp electric supply, upon open/close, control can then be hard wired to a wall switch, or radio controlled using a handset. 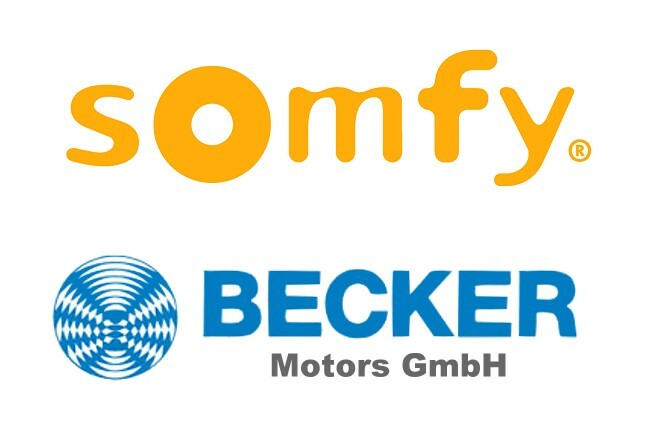 We use Becker and Somfy motors. 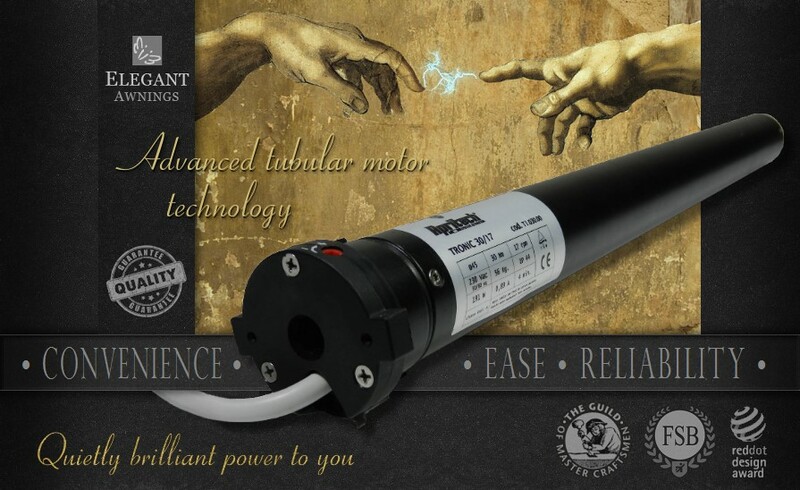 Based in Cluses, France, Somfy invented the tubular electric motor and to this day remain the market leaders. Their roots go back as far as 1750, when craftsmen in the Arve Valley made precision parts for neighbouring Swiss watchmakers in Geneva. In 1969, when a local awning manufacturer wanted to electric power his awnings, Somfy's founders responded designing their first precision electric drive, the LS, with a vast worldwide market waiting to be built. As industry pioneers, after years of continued development, their products today prove reliable to an extreme - a world apart from substitute imports inside budget electric awnings. At Elegant we have found the Somfy electric drive virtually faultlessly dependable. Electric patio awnings not only remove bother of manual winding, they also control their opening and closing in a regulated, consistent manner. 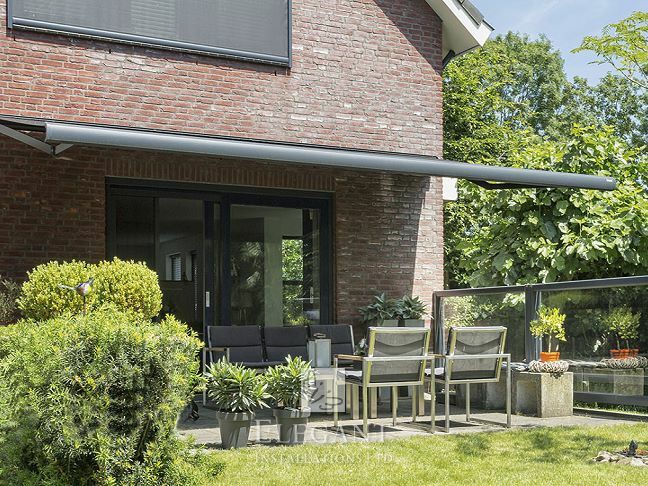 Correctly extending to their optimum projection, every time, to the centimetre, then retracting at a smooth controlled rate, to a soft close upon every use - this perfectly governed operation takes fine care of a patio awnings frame, its mechanism and fabric roll. We've seen how electric patio awnings are far less frequently left open; subjected less to unnecessary wear, strain, or chancing unattended weather damage. Pressing a button is simply quicker and easier than struggling using long crank handles, therefore just as electric units are easier to open, they prove equally easy to close away each time. 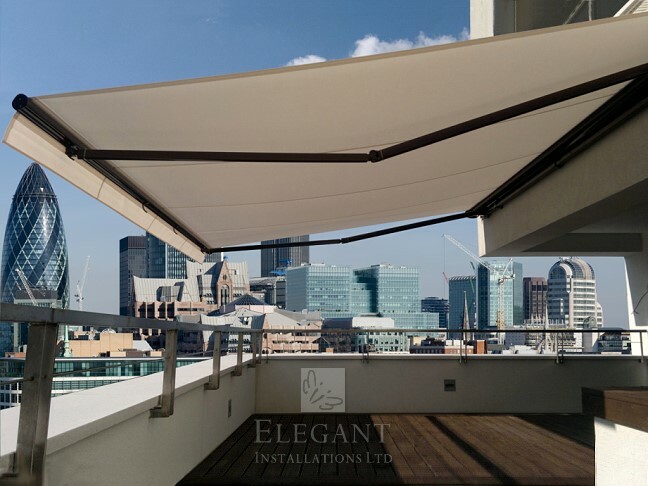 Lastly, electric patio awnings are able to have accompanying weather sensors; electric devices which can auto-close a canopy from wind, or automatically shade interior furnishings from strong sun. 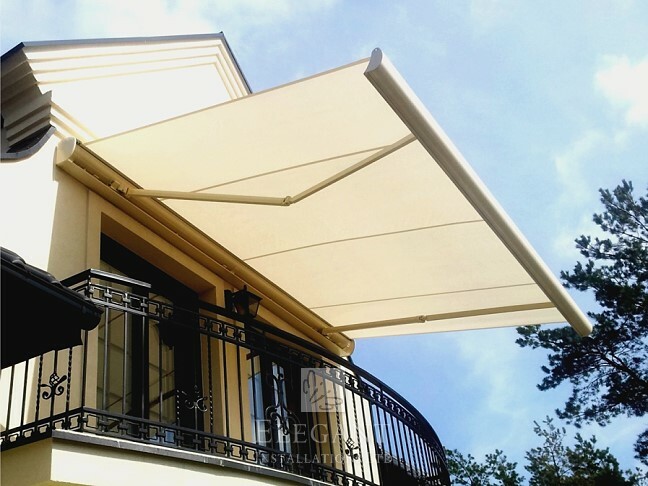 Wind & motion sensors are yet another reason why electric systems can last longer; these large patio canopies forming a substantial wind sail area. Moderna electric patio awnings combine compact design with sturdy durability. Strong folding arms can withstand gusts of wind, arms fully adjustable to an impressive 70 degree pitch angle. 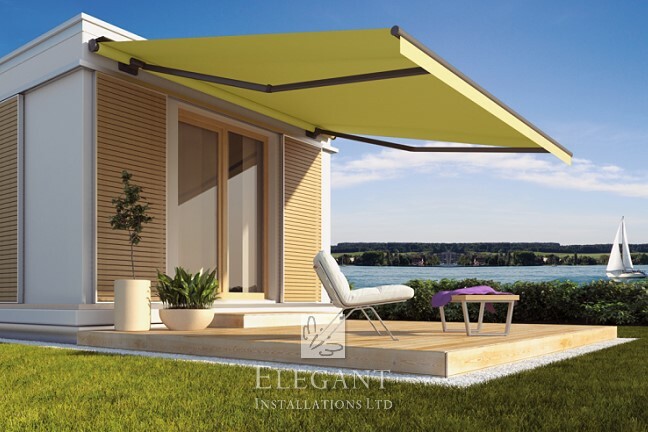 Slim in profile, cassette just 14cm in height, this quality awning looks stylishly compact on the wall and is also ideal for special bracket or bungalow brackets installation. Featuring forged arm joints, for lasting durable strength, plus chain arm tensioning and all metal construction, the Moderna covers all popular large sizes with a premium specification and quality finish. Quality built to be able to reach up to 4m outward, yet having a casing size just 13cm high, our Eclipse electric patio awnings can offer substantial shade from a compact styled design. Highly resistant to wind, this quality patio awning has multiple fixings to your patio wall, plus reassuringly strong shoulder joints. 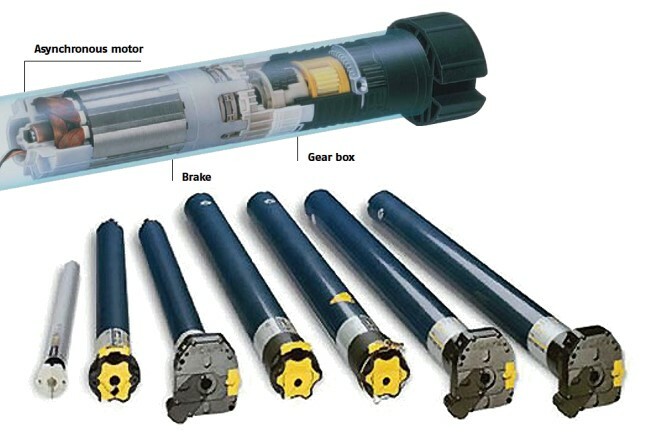 A low profile cassette fully protects its fabric coil and motor housed inside. 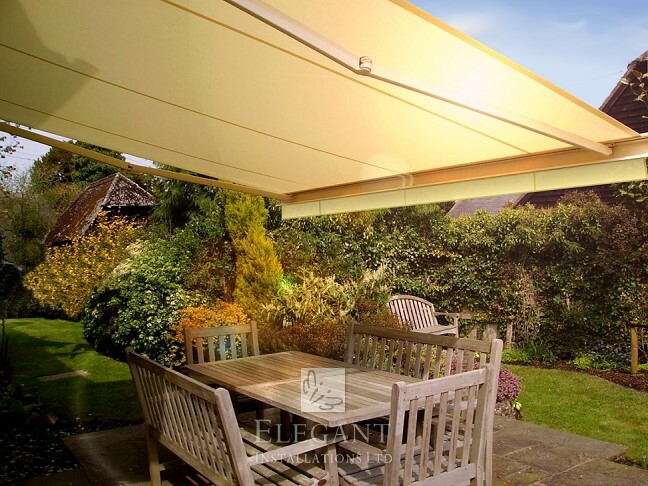 Elegant Elise electric patio awnings have proven a popular choice with customers looking for a great all-rounder. This quality engineered unit provides shade in abundance with its generous outward reach of up to 3.5m. It is also highly rain shower suitable while featuring a patented safety “wind-lock” arm mechanism. With a strong steel torsion bar running the full width of the cassette casing our Elise is quality built to last and aesthetically styled to suit any facade. Featuring many aspects of premium build quality our Markiza Ultima electric patio awnings offer strength, size and longevity. Its strong casing cassette box fits flush to any patio wall, a robust casing highly weather resistant to year round conditions. When closed, its fabric coil resides away from both arms and mechanism inside a separate internal compartment. With arm joints cut from a single solid block of aluminium, for greater strength, plus an all quality metal construction, designed to last, Markiza Ultima makes a proud, dependable addition to any patio. Elegant's entire patio awnings range can offer electric powered operation, some able to be dual-driven, having both manual & electric!